The armed men entered the Regional Hospital based in the city centre of Bambari, after previously threatening medical staff and patients last Thursday and looting the offices of nine humanitarian organizations, as well as the National Refugee Commission, during the course of last month. 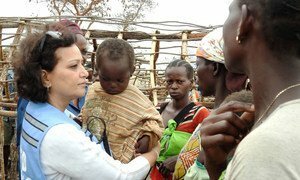 “I hold these armed groups directly responsible for this intrusion for any medical complications and life-threatening conditions of patients” Humanitarian Coordinator Najat Rochdi stated on Saturday. For five years, conflict has plagued the country, with violence intensifying over the past 12 months. According to preliminary estimates, relatives responded by removing some 30 vulnerable patients from their hospital beds, depite it's effect on their medical care. Ms. Rochdi stressed that civilian hospitals care for the wounded and sick, and should under no circumstances be attacked. She emphasized that they must be respected and offered protection by all parties to conflict. This latest incident constitutes an additional challenge for humanitarian workers in Bambari, particularly those administering healthcare. "The population is once again ‘held hostage’ by the impact of clashes between armed groups since May 14," said Ms. Rochdi, adding that civilians were "being cut off" from life-saving assistance. “I call upon the perpetrators of these acts to put the interest of the population above their differences,” stressed the Humanitarian Coordinator.